Click through to the Wright Enterprises website (linked above) to place your order. From a Kansas family farm to your table! 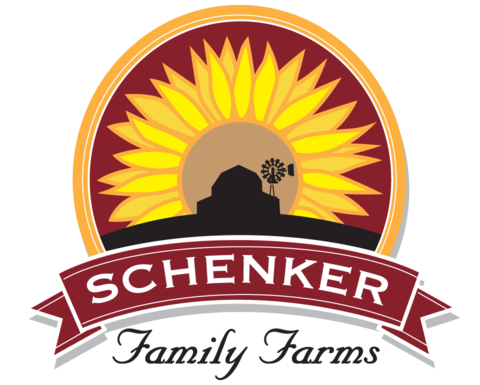 The Schlaegel family farm is just outside the town of Whiting in the northeast portion of the state. Owners Gary and Marion Schlaegel dedicated about 25 acres for growing their special popping corn which many have called “the best I’ve ever tasted”. Both white and yellow unpopped corn is sold, along with almost two dozen different flavors. At the Schlaegel Popcorn website, you can buy the unpopped corn as well as flavors like Caramel, Green Apple, Cheddar, Ranch, Jalapeno, and more. 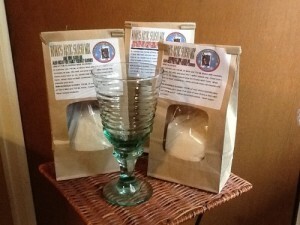 Gift packages are available, as are customized labels. Popcorn is a great thank you gift for clients, friends, and family! 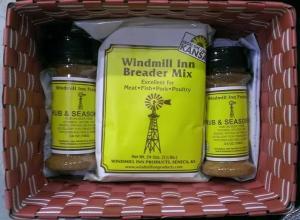 Heartland Mill: Out in western Kansas, some of the very best wheat for making bread is grown. In the tiny town of Marienthal, the Heartland Mill processes the wheat of its growers / owners into flour, particularly Hard Red Winter Wheat. At the Heartland Mill website, you can check out their online store front to see what’s currently available for shipping. 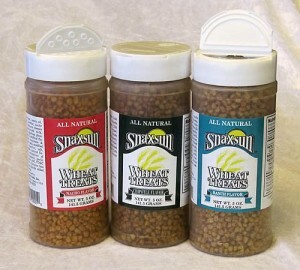 There’s a wide selection of flour, brans and meals, whole grains, and much more. It doesn’t get much more Kansas than products direct from Heartland Mill! One of the company’s specialty flavors is called Camo Crunch. 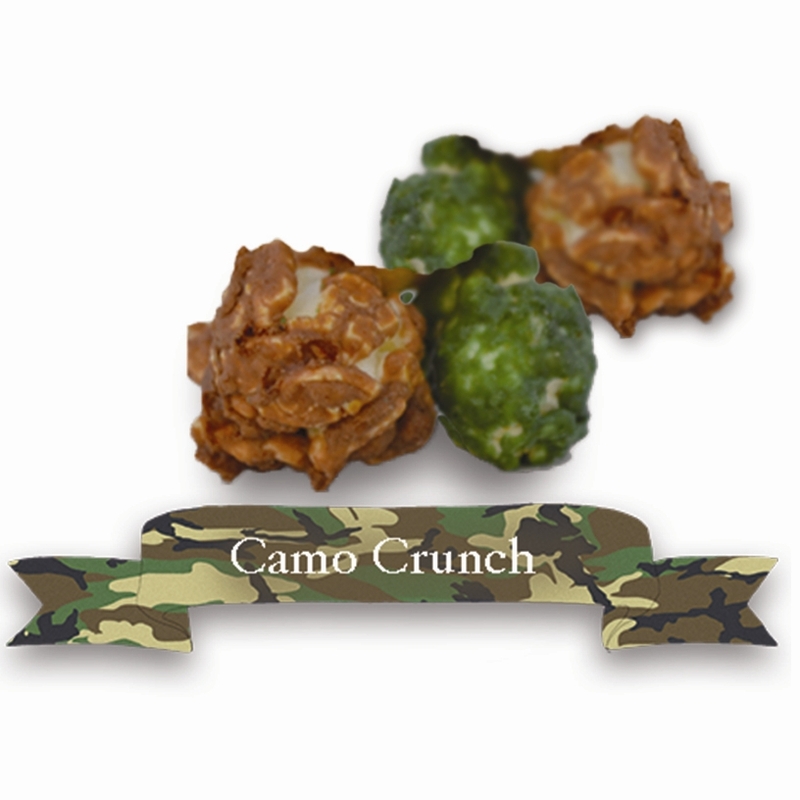 It’s a mix of their caramel crunch and a bit of chocolate in traditional camouflage colors – great for the outdoorsman on your list! A really good sauerkraut is something special. Even though I’m a Chicagoan and sauerkraut on hot dogs is something of a no-no in these parts, I love sauerkraut on a hot dog with a bit of mustard. 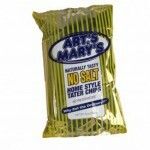 Of course, it’s also great as a side dish or as the key ingredient in a reuben sandwich! 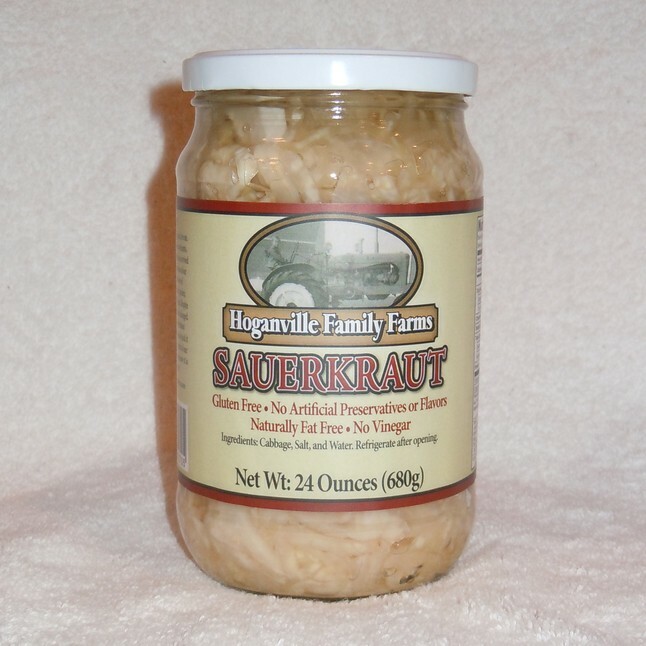 A jar of Hoganville Family Farms sauerkraut is a great gift and a real taste of Kansas. You can order it via the Buy Now link on their website in 12 and 24 ounce jars, or by the case. Also, be sure to check out the wonderful sauerkraut recipes listed on the site! Campbell Gardens Candied Jalapenos: This small Centerville, KS company has perfected a recipe for candied jalapenos. If you’re wondering what a candied jalapeno is, think of sweet & hot pickles and substitute a jalapeno pepper for the pickle and you’ve got the idea! 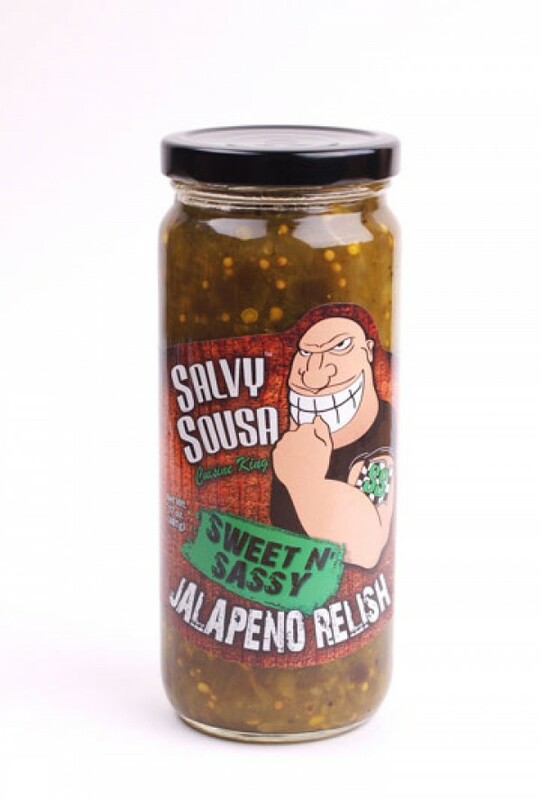 Perfect as an eye opening snack, the jalapenos are Kansas grown and jarred via a generations old recipe perfectly combining the elements of sweet and hot. Use them in salads, on burgers, and even pizza! 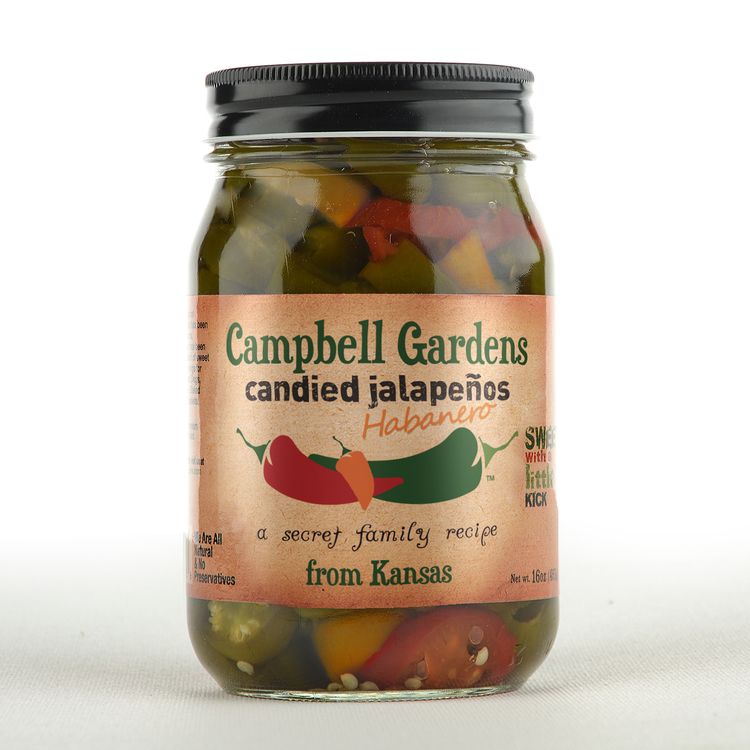 Campbell Gardens Candied Jalapenos make an attractive Kansas made gift. 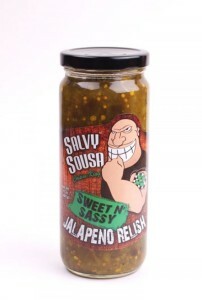 The red and green jalapenos are appealingly packaged and any foodie will love them! 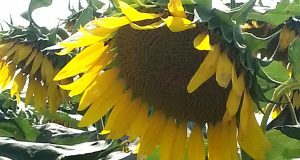 If you’re stuck for ideas how to enjoy them, there are lots of great recipes on the Campbell Gardens website. There’s also a version with habanero peppers for those who like things a little hotter! Click through to learn more and order! The company is also the maker of Chocolate Rocks – they look just like rocks you’d see on the ground except they’re made with milk chocolate. 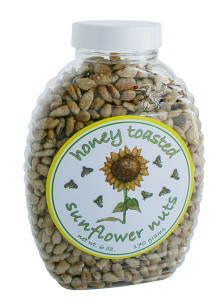 Our favorite Sunflower Foods product is their toasted Sunflower Nuts, pictured. These nuts are toasted with just a bit of butter along with natural honey – healthy and delicious! 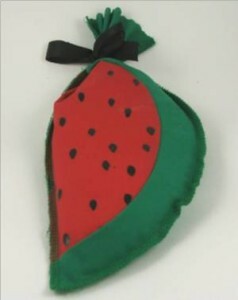 The company also makes several varieties of seasonal treats – ideal for gifts for Valentine’s, Christmas, Easter, and more. You can order any of their products online at the Sunflower Foods website – check them out and see all the interesting snacks they’re making! 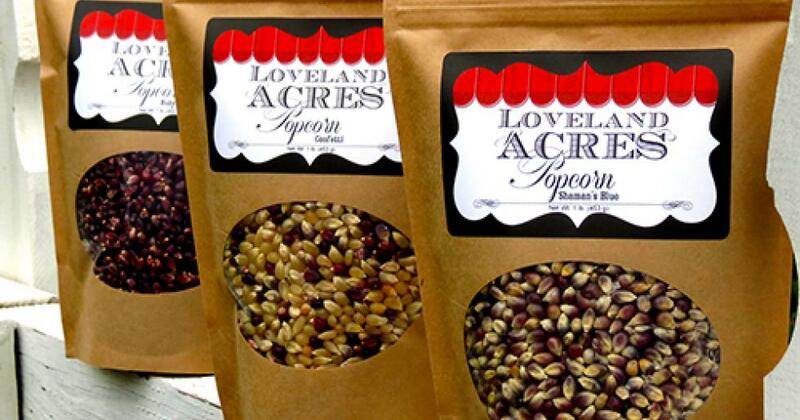 The end product of Loveland Acres Popcorn is particularly tender. It’s made with virtually hull free corn (you know, those kernel skins that get stuck between your teeth) and pop up tender and crispy. Ears of Ruby Red, Gourmet White, and Shaman’s Blue corn are used, which is why the kernels are different colors. Very American red, white, and blue! You can buy any or all of these popcorn varieties directly from the family’s Etsy site. You’ll find it linked on their main website via a “Buy Online Here” button … enjoy! Lost Trail Root Beer: Tom and Shelly Schierman of the Louisburg Cider Mill (see below) have been making their specialty recipe root beer since 1987. It’s created with an old family recipe, and if you’re a fan of smooth and creamy root beer, you’ve got to try this stuff! 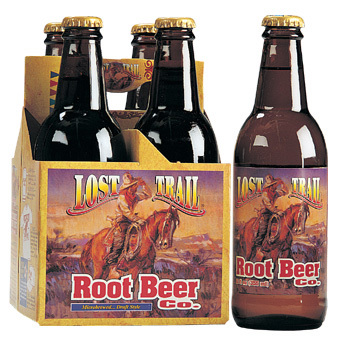 Lost Trail Root Beer is a Kansas original and one of several sodas made at the mill. Sugar Cane Cola, Cream Sodas, and Sarsaparilla round out the beverage product line. The company also makes dips, seasonings, and snacks – their Trail Mix is really good too! You can find Lost Trail Root Beer on the shelves in Kansas, but not so much outside of The Sunflower State. But you can order it online at their website in four packs – there’s a Buy Now link which takes you directly to their Country Store where you can get all kinds of goodies! 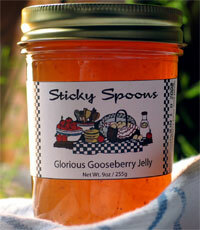 Part of the Sticky Spoons line includes jellies made from fruit indigenous to the local area, like Sandhill Plum and Elderberry. Pear, Peach, Blackberry, and Strawberry are just a few more of their all natural jellies you’ll find at their online store. For a real local treat, try their Kansas Cocoa Cake mix. It’s a moist cake made without eggs or milk and includes local sunflower seeds as a topping! Perfect as part of a Kansas themed gift! Check out all the Sticky Spoons selections at their website. They’ll ship right to your door! Local cheese makes a wonderful gift! You can order any of the Jason Wiebe Dairy cheese via PayPal directly from their website. A true taste of The Sunflower State! The packaging of these muffin mixes sets them apart. Shown is the watermelon muffin mix, cleverly packaged in a colorful bag. Themed gift boxes are also available, like their Apple Harvest Box, Biscuit & Gravy Box, and several more. Great gifts from central Kansas! 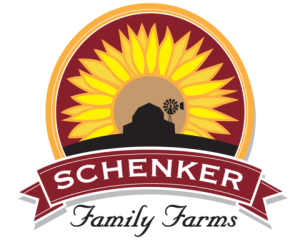 Schenker Farms sells several different gift packs if you’re looking for a local Kansas gift. The Apple Delight Gift Box contains jars of applesauce and two flavors of apple butter, just perfect to spread on your breakfast treats. 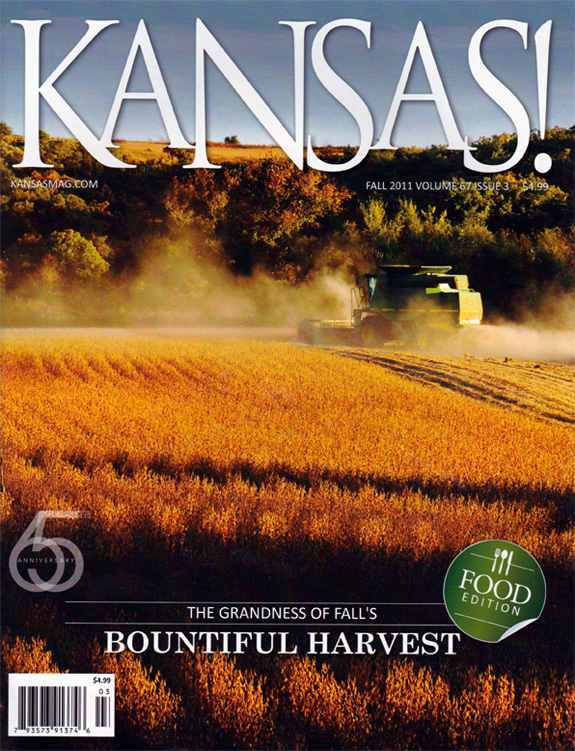 Click through to their website to see all their fresh from the Kansas farm products! Ribs, pork chops, and smoked pork loins can be ordered for your next cookout. For the beef lover, whole or sliced briskets are available. And when in Kansas City, stop by their location on State Line Road for lunch. As you might imagine, their BBQ pork sandwiches are outstanding! See all the choices at the Fritz’s KC Meats website and grill your own Kansas City barbecue classic! The strawberry wine slush mix is pictured. All that’s required is a 750 ml bottle of wine of your choice, the same amount of water, and the slush mix packet. Then freeze until it’s the proper slushy consistency. Great on warm summer evenings! 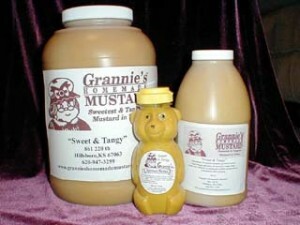 Check out the entire product line at Nana’s Comfort Foods online store. They sell gift baskets too! Grandma Hoerner’s: Located in Alma, KS about a half hour west of Topeka, Grandma Hoerner’s is a specialty producer of natural and organic foods. 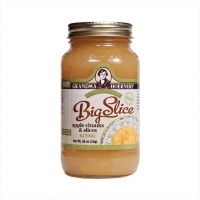 The company is best known for their signature product, Grandma’s Big Slice Applesauce, and has branched out to sauces, pie fillings, premium dry mixes, and more. Check out the Grandma Hoerner’s website to see their full range of products … another of their specialties is a line of BBQ sauces called McCoy’s Real, created and developed by company founder Duane McCoy. 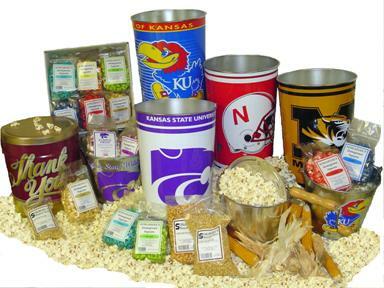 Many different gift baskets are available if you’re looking for a specialty food gift from the Sunflower State! Fruit butter is made by cooking the fruit down to a creamy, spreadable paste and then augmenting the mix with sugar and spices. It isn’t a butter per se but it has the same consistency as butter and can be used as a spread on bread, toast, muffins, and baked goods … their peach butter is the best we’ve ever had and we are always on the lookout for a good peach butter! 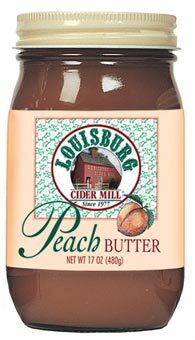 At the Louisburg Cider Mill website, you’ll find these fruit butters ready to be shipped to you or as a gift for someone special. You’ll also find their cider, preserves, salsa, dip mixes, and all sorts of gift baskets available. A great gift for someone who appreciates the good taste of Kansas! Still a family farm, the company started by growing raspberries and blackberries and branched out from there. 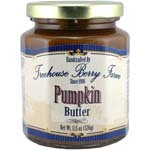 We recommend trying their pumpkin butter (pictured) which is very aptly described as “pumpkin pie in a jar”. We were given a jar as a gift and it was happily consumed in just a couple of days! They also make a red raspberry vinegar made from pressed raspberry juice … try it on a fresh salad! Original Juan’s is located on Southwest Boulevard in Kansas City, just over the state line into Kansas. They’re probably best known for their “pain” hot sauces, the ones with the screaming faces on the labels (see their online site for details). 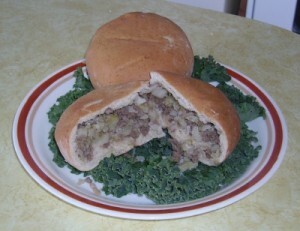 Have You Ever Tried A Bierock Sandwich? Becky’s Bierocks: So what exactly is a “bierock”? Well, as you can probably surmise by the picture at left, it’s a sandwich of sorts … a yeast dough outer shell that’s filled with ground beef, spices, fresh cabbage and onions, and sometimes other vegetables. You can order bierocks online from Becky’s Bierocks from St. Francis KS, where owner Becky Roberson hand forms and stuffs these tasty sandwiches to order. 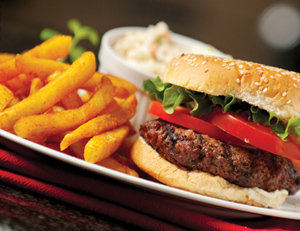 There are three different varieties … ground beef, ground beef with cheese, and German sausage. Just heat in the oven or toaster oven and enjoy! Based in Cheney, KS, Art’s and Mary’s makes eight flavors of kettle style potato chips … everything from low fat to BBQ to salt and vinegar. Rabbit Creek Gourmet creates mixes for easy to create artisan foods, like breads, muffins, soups, sweets, drinks, and more. One of our favorites is the cheesy pull apart garlic beer bread mix, which is so easy to make that even I can do it! Fanestil Meats: Fanestil Meats producing fine smoked meats since 1942. 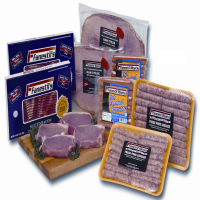 Located in Emporia, KS right off the Kansas Turnpike, Fanestil’s is well known for corporate and employee gifts like smoked hams, turkeys, sausages, and pork combination packs (shown). As an example, the Pork Lover’s Package contains two pounds of bacon, two pounds of smoked sausage, four center cut pork chops, two packages of breakfast sausage, and two pounds of bone in ham steaks. Now what meat lover wouldn’t like to receive that as a gift? “Kansas Girl” Tee – A Great Gift or Just For You! Mother and daughter duo Susan Karlin and Jordan Ottley operate Be Made, Inc. in a recently expanded and renovated historic building in downtown Hays, an agricultural based community in the west central portion of the state. Be Made’s emphasis is rooted in well designed, “retro quirky” items that combine practical, vintage, and unique. 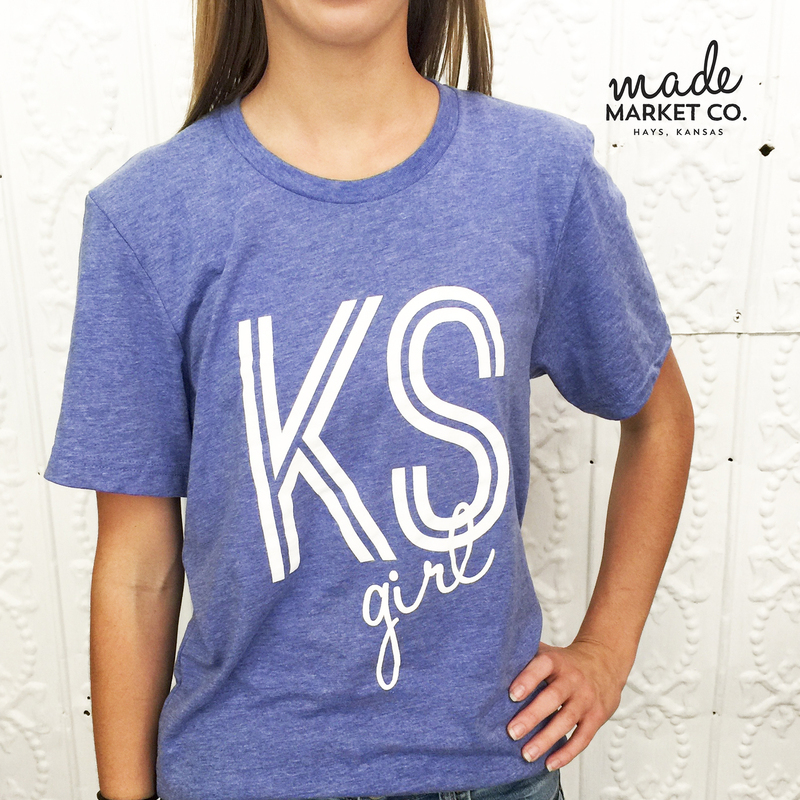 Recently introduced are the fun “Kansas Girl” T-Shirts, pictured. They’re a perfect gift item or to wear yourself to show off your Kansas pride! Don’t Forget Your “Kansas Kid”! Click through to their website and be sure to check out the Kansas Tee line … they’re available for kids too! 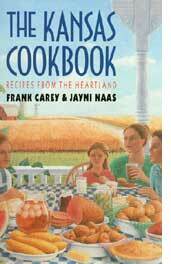 In this book, available for purchase via a link at the Kansas Heritage website, you’ll find traditional Kansas influenced recipes you’ll find nowhere else. Dandelion Jelly, Black Walnut Pie, and Sunflower State Wheat Bread are just a few! Brain Freeze Design: Kansas Souvenirs: If you look around, you can probably find state themed souvenirs in big chain stores, but we’re willing to bet they’re made in China or some other country. Not so with this cool company from Wichita we discovered recently! They’re Brain Freeze Design, and they manufacture Kansas themed products and mementos right here in The Sunflower State. 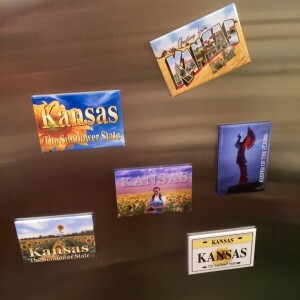 From state themed car tags and magnets to coasters, mugs, and cutting boards, this company is your one stop source for good looking Kansas souvenirs. They’re great gift ideas or perfect for yourself and your home. Let your state pride shine through! 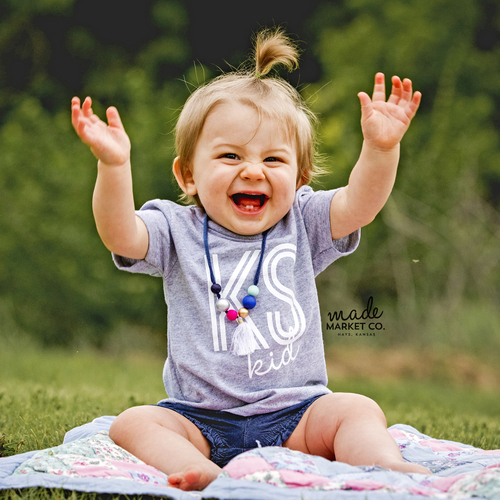 T-shirts and photo frames are just a couple of the many other items Brain Freeze produces – let their creative designers come up with something special and unique for the Kansan on your list! Memorable Sunflower State themed items … Made in Kansas! From container candles to votives to meltables, there’s a wide spectrum of fragrances available. We were especially drawn to some Sunflower State themed candles they offer, like Kansas Rain, Lavender, and Kansas Sunflower. They’re just a few of the over three dozen varieties you’ll see at their website. Each is handsomely packaged in an eco friendly boxand ribbon – perfect as a gift for someone who holds Kansas near and dear to their heart! 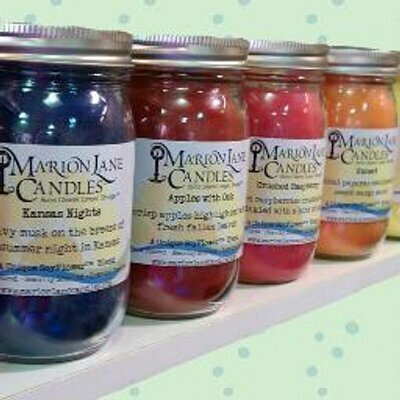 In addition, the store hosts candle making parties for groups, so if you live in the area, drop Connie a line to set up a unique get together for your next outing. 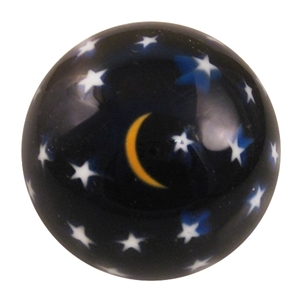 The company also specializes in private label candles, corporate gifts, and promotional items. A really cool independent small business in Topeka! 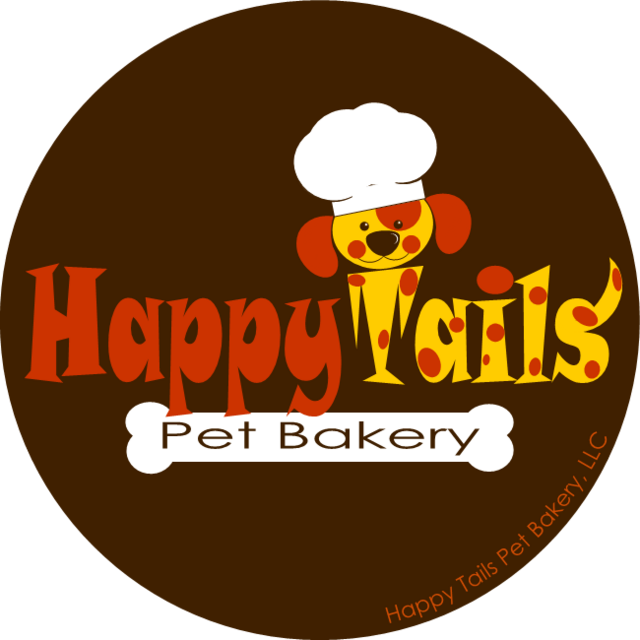 We’re also big advocates for home made natural treats made by dog lovers like Charity Overman, owner/baker of Happy Tails Pet Bakery of Wichita. Proud owner of several rescue pets of her own, Charity discovered the need to create delicious human grade treats when one of her dog friends suffered from allergies. Those efforts soon blossomed into a small business, and now Happy Tails creates dog treats guaranteed to set your best pal’s tail to waggin’! Click through to Charity’s website and you’ll see their best seller, Peanut Buttah Bones, augmented by flax seeds for a soft, shiny coat. Or, take a look at the Pupcakes, colorfully designed and made with natural peanut butter, carrots, honey, and unsweetened carob chips. Custom doggie cakes, Appolasses Training Bites, and new Sweet Potato Treats round out the product line (dogs love sweet potatoes!). Get your best friend or that special neighborhood dog something they’ll really love, direct from Wichita in The Sunflower State! 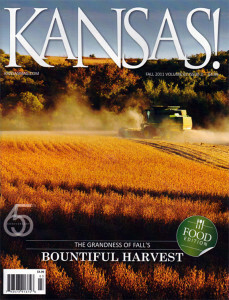 Each issue of Kansas! offers features on state destinations, getaways, and undiscovered gems. You can count on exceptional photography and writing from some of the best and brightest Kansans. Subscriptions are exceptionally reasonable for a one year term, and discounted for multiple years. An ideal gift for someone who loves Kansas! Kansas Lavender: Lavender is a remarkable herb. It’s a hardy plant that’s drought resistant and thrives in ample sun and well draining soil … which describes Kansas pretty well! 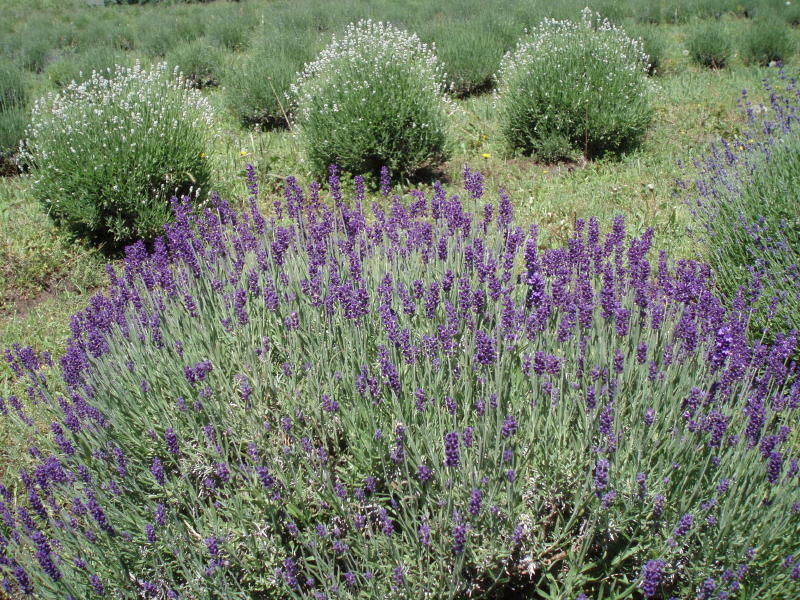 The word lavender means “to wash”, and the herb is frequently infused into soaps, lotions, and homeopathic remedies. Lavender can be used to treat wounds, mixed into spice blends, and as a natural insect repellent for you and your pets. A Great Discovery in Topeka! Hazel Hill Chocolate Traditions: We had the pleasure of visiting Topeka recently (see the travelogue below) and one of the appealing independent businesses we visited was Hazel Hill Chocolate Traditions on Kansas Avenue. It’s been a couple months and we’re still talking about the fantastic hand dipped caramel apples! Specializing in chocolate truffles, homemade fudge, and of course caramel apples, the business is owned by Nick & Terry Xidis and named after Terry’s grandmother. Nick is a 3rd generation chocolatier and you can taste the fine craftsmanship in every bite. Fresh cream, real butter, and the finest chocolate are used to create small batches of spectacular treats, which you can enjoy in person or via the Hazel Hill Chocolate online store. 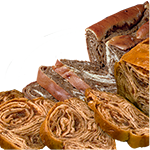 The povitica, which you can order at their website for shipment, comes in nine flavors … walnut, cheese, apricot, poppy seed, apple, cranberry, pumpkin, pineapple, and chocolate cream cheese. We liked the apricot and pumpkin flavors but we’re quite sure they’re all good! 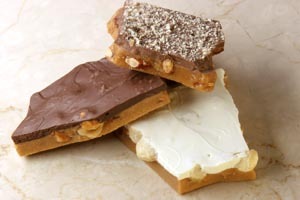 “Toffee of the Month” Club – A Sweet Gift! It’s the Toffee of the Month Club, the ideal gift for chocolate lovers. Different styles of Tall Grass Toffees are featured and shipped every month for 4, 6, or 12 months. Just to give you an idea of some of the flavors … December is White Chocolate Christmas Cherry Pistachio Toffee. In May, it’s a Cinco de Mayo Toffee made with ancho chiles. 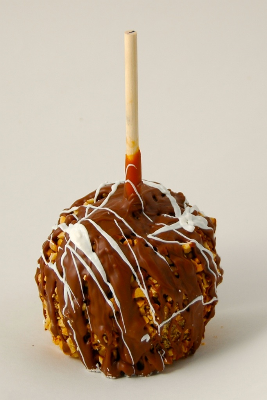 In August, it’s Dark Chocolate Roasted Hazelnut Toffee. You get the idea! 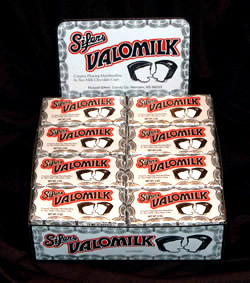 Valomilk: Valomilk is a unique chocolate and marshmallow candy that has been made in Kansas for the better part of 80 years. The candy itself is a milk chocolate shell that’s cup shaped and filled with marshmallow which is creamy rather than solid. You have to taste them to see what we mean! The term Valomilk is a combination of the ingredients … “V” is for vanilla, “ALO” is from marshmallow, and “MILK” describes it as creamy. The company is located in Merriam, just outside of Kansas City, but Valomilk is hard to find even in the Kansas City area. Brad Mangas Photography: Quite often when we travel for pleasure, a work of local art comes back home with us. A wonderful reminder of places seen and people met, local art is also a healthy inspiration to venture out and travel more frequently! You can view and purchase many of his latest works at BradMangas.com. You’ll find prints, cards, calendars, and much more. 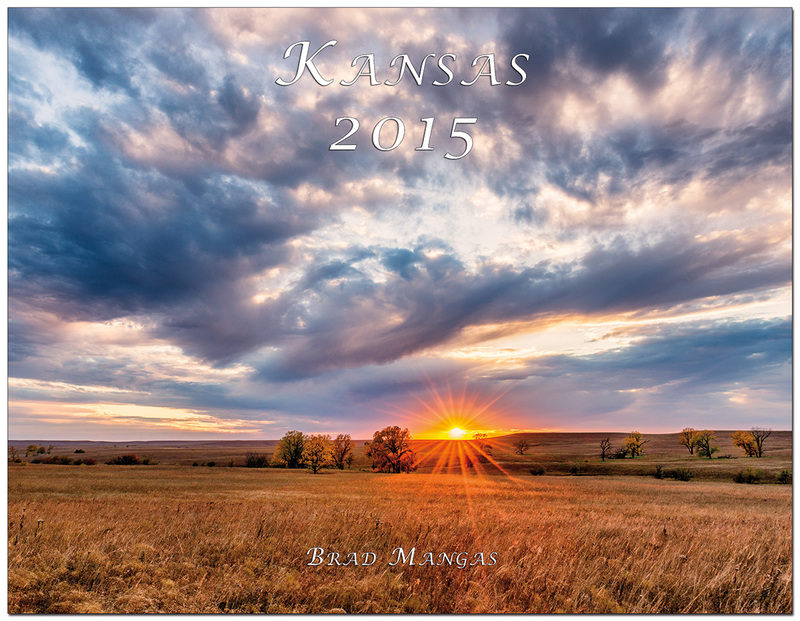 Brad has a real eye for capturing the scenic beauty of the state, and if you’ve visited Kansas, you know what we mean! Local unprocessed honey is one of the best natural products you can consume, with ample health benefits. Honey helps diffuse outdoor allergy symptoms and is known to help alleviate joint problems and high cholesterol. It’s perfect for a healthy, natural mid afternoon energy booster and best of all, it tastes great! You can buy honey from Rowan’s in several different sizes, as well as their many honey based sauces, jams, lip balms, and moisturizers. Check out their website to see all the products they’re producing – wonderful gifts from south central Kansas! John & Wayne Honey Farm: A local honey processing operation located in the small eastern Kansas town of Quenemo, John & Wayne Honey Farm is an excellent source for local Kansas honey. A family run operation, 50 colonies of bees are tended to as they help create wildflower honey from the surrounding rural area. The honey is bottled 100% natural, with no additives or preservatives, thereby maintaining raw honey’s important health benefits. Delicious and sweet, you can practically catch the aroma of wildflowers in every bottle! The farm also produces related honey products, like lip balm, honey sticks, lotion, and soaps. You can visit them in Quenemo, about 45 minutes from both Topeka and Lawrence, or just shop online at their website. A fresh local product from The Sunflower State! We’re big fans of their line of seasonings, especially the Garlic Pepper With A Twist Of Lime variety. 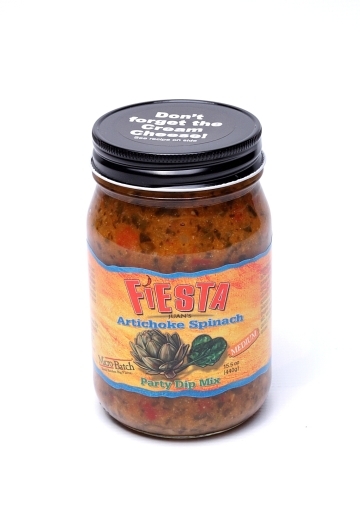 We use it frequently in stir fry dishes, on shrimp, and as a taco and enchilada seasoning. All of their seasonings are very all purpose and adaptable – you can see them at the Copper Leaf Gourmet website. You’ll also like their pepper jellys … flavors include Apricot, Pineapple, Harvest Blend, and Triple Berry Chipotle. Serve these as part of an appetizer spread, or simply to liven up crackers or a sandwich! And don’t miss out on their line of sauces, especially a winter season specialty called Cranberry Citrus Spice. 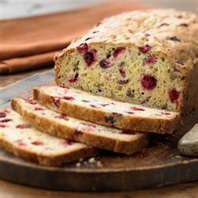 It’s a mix of cranberries, citrus, and spices designed to complement and enhance any turkey, ham, or chicken dish. Spread a little atop the meat just before cooking is completed for a special taste treat. Click through to the Copper Leaf Gourmet site for tasty gift ideas direct from beautiful Lawrence, Kansas! The all purpose seasoning rub is designed to complement the flavor of burgers, steaks, pork roasts, or any kind of meat. It’s also great in a meat loaf recipe and can be used as a traditional rub or sprinkled on toward the tail end of the cooking process. 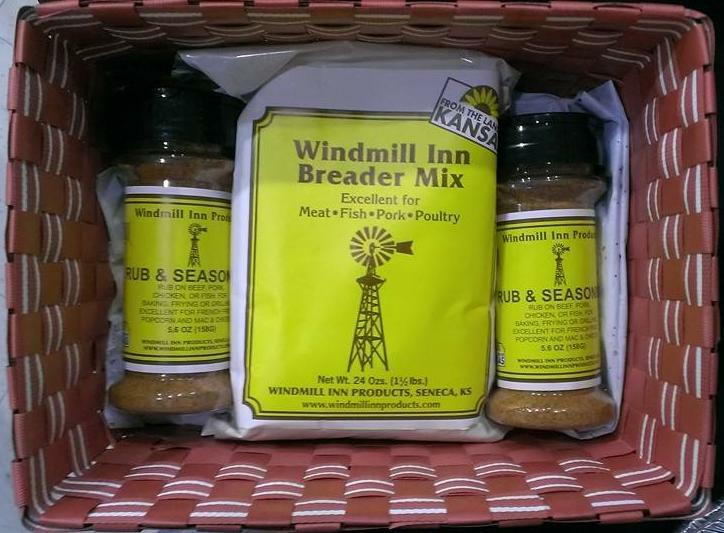 The Windmill Inn Products are available in select specialty stores in The Sunflower State (there’s a list on their website) or you can order them directly at their site. Be sure to check out the handy gift basket option on the Products page – a really nice personal gift from Kansas for anyone on your list who likes to prepare good food! Salvy Sousa Sauces and Condiments: On a recent trip through southeast Kansas, we drove through the community of Arkansas City, located where the Arkansas and Walnut Rivers meet just a few miles north of the Kansas / Oklahoma border. The town is often known by the abbreviated name “Ark City” and the full name is not pronounced like the state of Arkansas … the final “s” is pronounced. You can also order products in four packs, six packs, and a Jumbo Mobster Basket which has everything! Enjoy the great taste of southern Kansas with Salvy Sousa! Jack’s Gourmet Seasoning is now available in many Kansas stores and a few stores in other states, as well as online from his website. It’s an extremely versatile seasoning that’ll complement barbecue, grilled meats, and even cold salads (try it on potato salad, it’s great!). 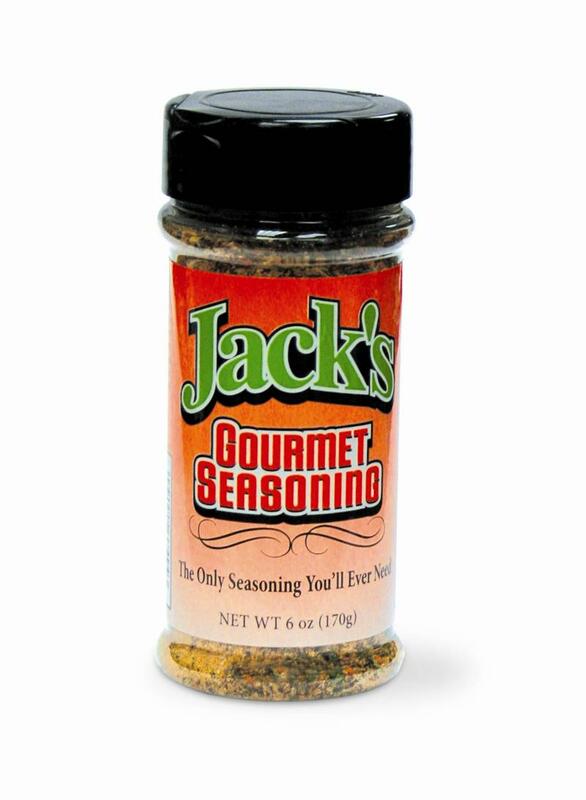 You can order Jack’s Gourmet Seasoning online in six and twelve ounce sizes as well as larger quantities. Give Jack’s a try, your taste buds will thank you! 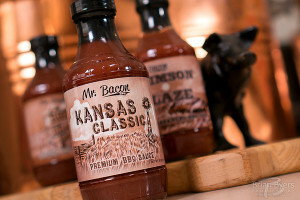 You can buy these sauces, as well as Mr. Bacon rubs, individually or in mix and match three packs at their online store. A tasty gift from beautiful Lawrence, Kansas! We’ve Got A Lot More Kansas Made Products To Come, But In The Meantime, Tell Us About Your Favorite Kansas Products … Add Your Comments Below! We recently completed a Midwest circle tour of sorts … the objective was to visit as many state capital cities as we could in a week’s time, while giving ourselves enough breathing room to enjoy the cities and see some old favorites along the way. Our first stop was Des Moines, Iowa – then on to Omaha and Lincoln, Nebraska, and then south into Kansas for our 2nd ever visit to Topeka. We hadn’t been to Topeka in almost 20 years and vowed to get to know the city this time. We spent the better part of two days here and while it wasn’t quite enough to see everything, we covered a lot of ground! This is a cool small Midwestern city that often gets overlooked by those traveling through Kansas. It’s only an hour due west of Kansas City and about 25 miles or so west of Lawrence, a fun town that’s home to the University of Kansas. 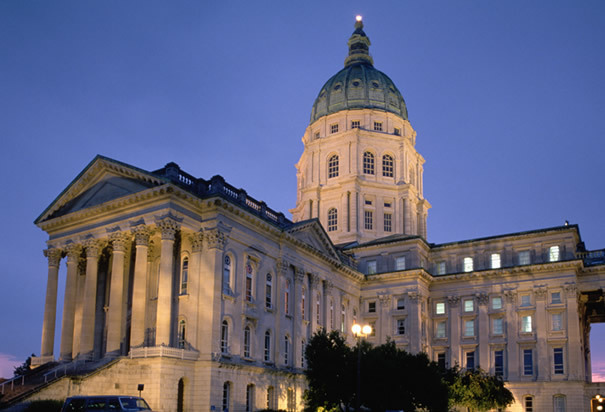 Topeka too is a college town – it’s home to Washburn University – but it’s better known as the heart of the Kansas state government. Join us as we discover this welcoming city along the banks of the Kansas River … Topeka! When we plotted out our one week sojourn, we discovered “all roads lead to Topeka”. Well, maybe not exactly, but the city is quite easy to reach. As mentioned, it’s only an hour from metro Kansas City. Des Moines is four hours away, Omaha and Lincoln Nebraska about 2 1/2 to 3 hours drive. Topeka’s name is interesting … it’s from a Native American phrase roughly translating to “good place to dig potatoes”! We didn’t seek out any potatoes here (although we found some great places to eat), but we did find a warm, friendly populace happy to offer helpful guidance and suggestions. 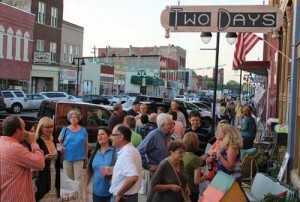 The city sits along the south bank of the Kansas River – the area immediately to the north is known as “NOTO” which stands for North Topeka, which is the area’s primary arts district. With a population of just under 130,000, Topeka is large enough to have plenty to do yet small enough to be easy to get around. More or less laid out on a standard grid, this capital city is simple to navigate – if you happen to make a wrong turn, don’t worry, you’re still probably 10 minutes of less from wherever you wanted to go. For a city this size, Topeka has a surprisingly active food scene, which we’ll touch upon below. Our choices lean toward local, independent, and historic … but you won’t be disappointed if you’re looking for just about any type of cuisine. We were also impressed with the youth and vibrancy of the city. Farmers markets, art walks, and live music are common events. There’s always something going on here and there’s a palpable sense of community. Completed in the late 1880’s, this building recently underwent an extensive rehabilitation, now completed. You’ll notice the gleaming dome atop the building, with a crowning bronze statue which was placed at the crest in 2002. This is the only state capitol center in the country that allows visitors to literally climb to the top of the dome … the experience is appropriately called the Dome Tour. Given Monday through Friday several times a day, the Dome Tour is a one of kind experience. There are 296 steps leading from one of the building’s upper levels taking you to the very top of the dome and a small outside observation deck. Tour participants walk single file up the somewhat steep and winding steps … there are no elevators, no bathrooms, and no rest areas. If you’re in relatively decent shape and heights don’t bother you, this is a fantastic experience! Once you reach the top, you’re rewarded with an expansive view of Topeka, along with close up views of the dome itself. Walking back down is almost as fun as walking up … there’s a definite feeling of accomplishment! For shopping, check out the neighborhood just north of downtown and the Kansas River … it’s known as NOTO (which stands for North Topeka) and the name of the area is the NOTO Arts District. You’ll find lots of galleries, local art, and independent shops here, and the area hosts lots of special events including art walks. Retail stores like 4 Girls Garage and Portico offers unique one of kind home accessories and decor you didn’t know you couldn’t do without! Another area to check out is just north of the Washburn University campus. It’s known as the College Hill neighborhood and it’s home to shops, restaurants, and condos and townhomes. One of the city’s oldest bars, Oscar’s, is located here and it’s a local hangout for anyone seeking a cold beer and good bar food. 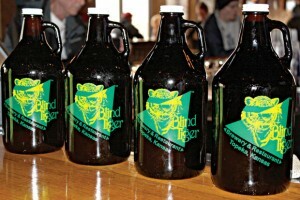 Beer To Go and Great Food at Blind Tiger! These days, the Blind Tiger Brewery & Restaurant is a sprawling establishment housed on several levels and is one of the most popular spots in town. They make their own beer on site, the food is really good, and it’s a friendly and lively place. 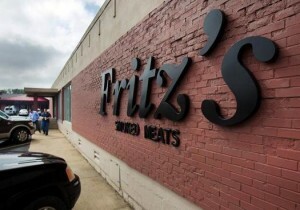 We splurged on a Kansas City Strip steak here … fantastic! 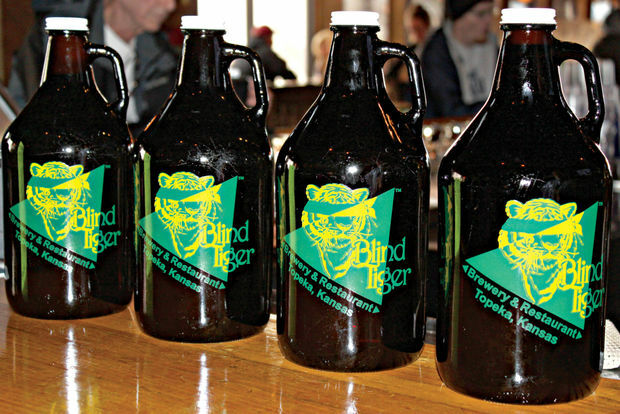 And if you’re a fan of interesting yet approachable beers, try Blind Tiger’s flagship ales like County Seat Wheat and Tiger Paw IPA. They’re the perfect antidote after a full day of sightseeing! If you’ve followed our previous state capital city travelogues, you know we’re always on the lookout for historic independent places. 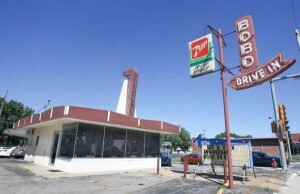 In Topeka, one of the best is Bobo’s Drive In, a fun casual car hop service landmark about two miles west of the capitol complex on 10th Street. 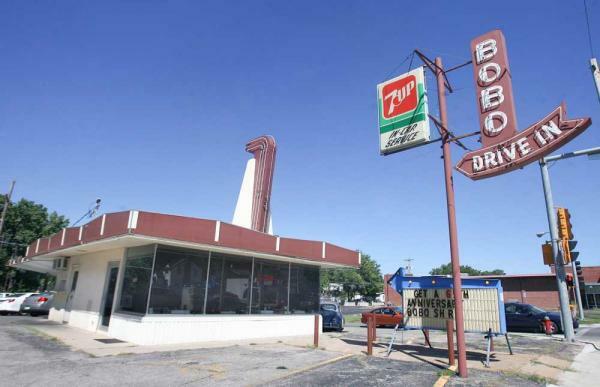 Steakburgers, onion rings, and milk shakes are the stars here, and Bobo’s has been featured on The Travel Channel as well as being named one of the “8 Wonders of Kansas Cuisine”. This place has been around for over 60 years and it’s easiest to just pull up and settle in – there’s limited seating inside and it fills up pretty quickly. The perfect place for a truly Topeka lunch, Bobo’s isn’t fancy, but it’s convenient, fast, and very good! Another place we really enjoyed is also on 10th Street, just east of sprawling Gage Park. It’s the Dutch Goose Sports Bar & Grill, which some might call a dive bar. It’s really just a friendly neighborhood bar and grill that has been around for over 70 years doing what they do. 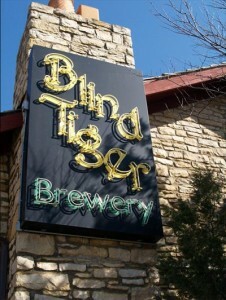 Our burgers were terrific, the service was friendly, and the beer was nice and cold on a warm Kansas day! Finally, if you’re the sweet treat type (and who isn’t! 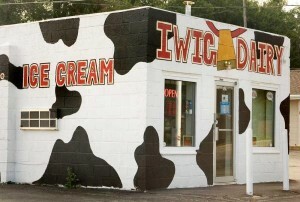 ), check out the Iwig Dairy Store on Gage Boulevard across from the eastern border of Gage Park. Stop in for creamy fresh ice cream and other dairy treats. Iwig usually offers a special milk flavor of the month … when we were there it was Root Beer Milk, which tasted just like a root beer float. The perfect nightcap! We were so glad to get back to Topeka and we hope we’ve given you a flavor of this friendly city. This is a great place to spend the night before heading on to Kansas City to the east or Wichita to the south or any other Kansas destination for that matter. 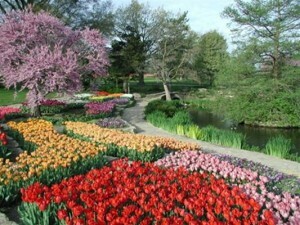 Give yourself at least one full day here, and more if you really want to dig in and get to know the capital of Kansas. We’d definitely stop again our next time through The Sunflower State! For more information and details about Topeka, be sure to check out their official visitor’s site, Visit Topeka. Thanks for joining us!